Get it, she's "dropping in"? Ha! Bringing down a large group? We always appreciate a heads up! $14 for unlimited use of the Inflatable Sports Arena, Adrenaline Zone and Moebius as well as free play of pinball, air hockey and vintage video games, and the "Blue Room". Adults can even relax in our massage chairs. 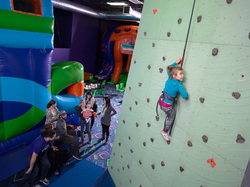 $24 for unlimited use of all of the Inflatable Sports Arena, Adrenaline Zone and Moebius, the climbing wall and laser tag as well as free play of pinball, air hockey and vintage video games, and access to the "Blue Room". Adults can even relax in our massage chairs. click here for a special deal on school days and summer weekdays! $119 Family Fun Special: includes 4 Everything wristbands, 1 16" pizza with unlimited toppings, 4 beverages (beer, wine, house cocktail, Bounce Chill, or sodas with unlimited refills) and 4 freshly baked cookies. Click here to sign your waiver before you come so you can get right to the fun! The days of kids begging you for another handful of tokens (or running through them yourself) are over. Our games are all set to free play with your paid wristband, so you can focus on having fun, not on your wallet. Special events (bungee runs, Twister, dodgeball, soccer, basketball) take place throughout the day for children and adults, and are also included in the price of admission. If you'd like to play a specific game, ask one of our hosts, and we'll help to organize a game. Just watching? Adults are welcome to enter for free with children. But when you're ready to get into the action with some fun of your own, we've got your wristband waiting for you. You're never too old to Bounce! Add a sumo suit experience to your wristband for only $10 per person (18+ only)! Birthday and other private parties (for kids and adults) start at only $270 for a two hour event, complete with private party host and private room. Private events at Fling Milwaukee available now, too!